Considered one of the continent’s top creatives, he’s garnered a string of awards both locally and abroad, winning the 2015 Vogue Italia Scouting for Africa prize, and named one of the 100 Most Influential Africans of 2017 by New African Magazine. Most recently, he formed part of the cohort that collaborated with Ikea on its first African-designed collection. Ngxokolo credits much of his work to his late mother, whom he calls “a great officiator of culture and craft”. 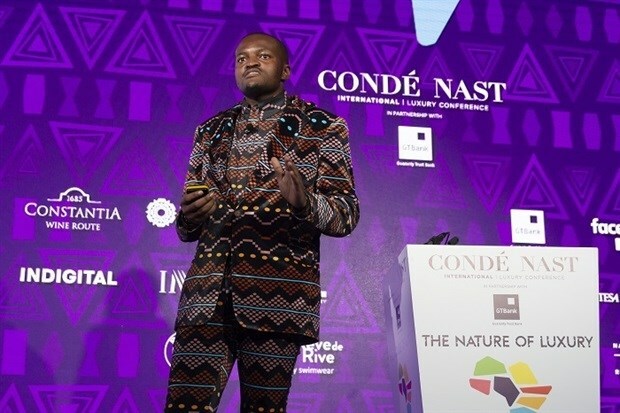 Speaking at the Conde Nast International Luxury Conference in Cape Town last week, the designer shared how her deep love for Xhosa culture nurtured his own. “She loved collecting anthropology books. She taught us about traditional crafts and beadwork, about where we come from… as bedtime stories sometimes. "What I noticed from these stories was the sense of elegance that was there. Even though our identity was lost somewhere due to colonialism, we had a sense of elegance and luxury as black people. I appreciated that a lot." Beautiful image of two men from the AbaThembu clan showing off their extravagant beadwork game in the beautiful hills of Transkei. Inspiration to #MAXHOSAbyLADUMA | #MyHeritageMyInheritance | �� from: African Elegance book by Alice Meriens and Joan Broster. Ngxokolo and his three siblings grew up in Port Elizabeth in a financially constrained household. He recalled accompanying his mother to a charity shop as a teen to buy their first TV, and then he and his siblings’ disappointment when she walked out with a small knitting machine instead. But it was this knitting machine that at the age of 15, Ngxokolo would use to design and make his first sweater, with the help of his mother. One year later, she passed away. “Years after I started my business, I realised that my mother is the founder of the work I’m doing now,” the designer reflected. Ngxokolo said he knew from a young age that he was born to create. In high school he did Textile Design and Screenprinting as a subject, but his passion for knitwear was mostly kept a secret because it was still taboo for a young black man in the community to be knitting. Nevertheless, he went on to complete a degree in Textile Design and Technology at Nelson Mandela University. His thesis project, which looked at how the traditional Xhosa aesthetic could be interpreted into contemporary fashion for Xhosa initiates, would greatly inform the direction his MaXhosa label would take. Iconic fashion brand MaXhosa by Laduma, known for its signature bold and graphic knitwear designs, showcased their new Op Art-inspired Autumn/Winter collection at the recent AFI Fashion Week in Cape Town. As is customary, young Xhosa men go through the Amakrwala rite of passage, their initiation into manhood. During this time, they undergo circumcision and learn about traditional clans and customs. When they return home, their old wardrobe is replaced with an elegant set of clothing fit for gentlemen - smart trousers, blazers, hats and pocket squares. But Ngxokolo thought it odd that the new wardrobe of initiates didn’t reflect Xhosa culture. Instead, Eurocentric brands like Pringle of Scotland was the order of the day. 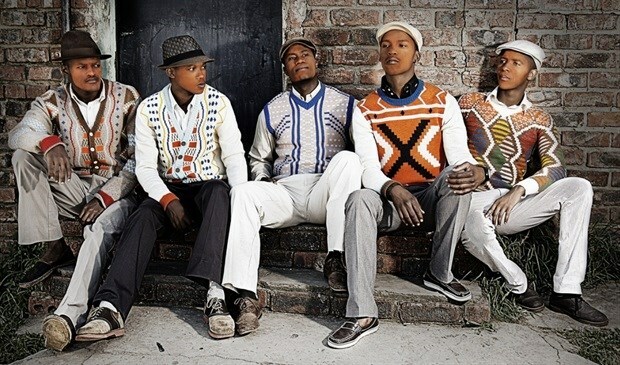 Guided by his initial vision to create modern Xhosa-inspired knitwear that would be suitable for initiates, Ngxokolo created his first 5-piece collection, which won him an award at an international design competition. This marked the beginning of the MaXhosa by Laduma brand. With the launch of his first women's line in 2014, business boomed. Since then, MaXhosa by Laduma has evolved into a lifestyle brand, expanding into categories like cellphone accessories and home décor. But no matter the surface, Ngxokolo’s bold signature prints are distinct indicators of a MaXhosa original. The Xhosa nation is one that’s evolving, Ngxokolo said, not restricted to one narrow, pre-defined aesthetic. Instead, through his designs, modern Xhosa identity can be displayed on a velvet suit or a chiffon dress; an iPhone case or a cushion cover. THE EVOLUTION OF #MAXHOSA AW18. Through his craft, Ngxokolo wants to help Africans restore black confidence. “When I visit African countries, I've picked up that people don't celebrate their heritage, because they've been told it's not enough. It’s one of my jobs to make sure we regain that.